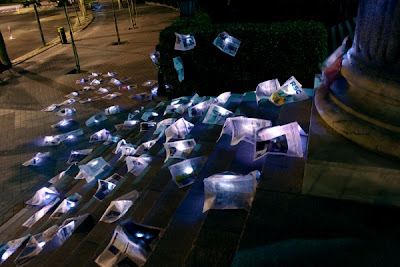 Luzinterruptus, is an anonymous artistic group based in Spain, who carries out urban interventions in public spaces using light as a raw material and the dark as their canvas. The three members of the collective come from different disciplines: art, lighting and photography and have a creative purpose of leaving lights on throughout the city of Madrid so that other people put them out. 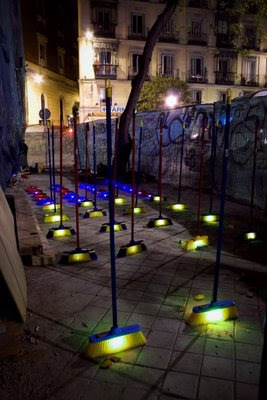 They began this interesting art collective on the streets of Madrid at the end of 2008 with the simple idea of focusing people´s attention by using light on problems they found in the city and that seem to go unnoticed by the authorities and citizens. Sometimes however their sole purpose is only to highlight anonymous places or corners that seem special or objects to which they think extraordinary artistic value. Find out more about them by visiting their blog. Heres and excerpt on their work, The Wind Brought Us The Crisis. Crisis wasn't a crisis until people who know about it admitted it was. While it was a simple rumour among people who were suffering obvious symptoms. But until the Stock Exchange showed the figures and the mass media echoed the news, the government had to admit the terrifying word. 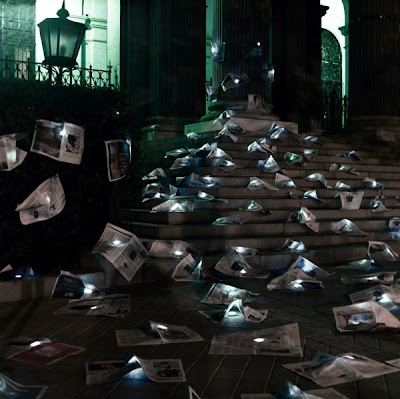 In this manner the crisis began suddenly, like an uncontrolled virus that had been transported by air without warning.With this in mind we decided to set up our lights with 80 financial pages from influention newspapers we collected in the previous month and left them fly in the wind on the emblematic building of Madrid Stock Exchange. One of the laboratories where the virus of the crisis began to spread. The installation `The wind brought us the Crisis´ was carried out on 28th April at Madrid's Stock Exchange which would hold a shareholder's meeting the following day in the same building. These photos were taken by Gustavo Sanabria. El Viento nos Trajo la Crisis. (”The Wind Brought Us the Crisis”).